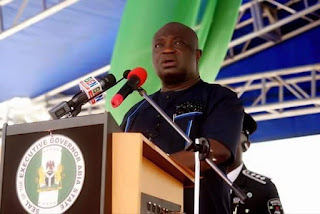 Abia State Governor, Dr. Okezie Ikpeazu has reaffirmed the determination of his administration to realise the full potentials of Aba, the commercial nerve-centre of the State. The Governor stated this today while speaking at the 1st Aba Urban Development Summit held at Enitona Hotel, Aba, Abia State. The Governor noted that the idea to convene the Summit was as a result of the determination of his administration to ensure that Aba attains it’s full potentials noting that Government alone could not resolve the challenges inherent in developing Aba and was thus seeking partnerships from development partners and interested individuals and organisations to help Government extract solutions towards the holistic development of Aba. Earlier in his goodwill message to the Summit, the Senator representing Abia South Senatorial Zone, Senator Enyinnaya Abaribe lauded Government for organising the Summit and called for it to be an annual event. Also speaking, the Director-General of the National Institute for Hospitality and Tourism, Mrs. Chika Balogun called on the Government to take steps to tap into the huge tourism potentials of Aba. Presentations and Goodwill messages at the Summit came from the Director-General of the Nigerian Environmental Standards Enforcement and Regulatory Agency (NESREA), Dr. Lawrence Anukam, Mazi Sam Ohuabunwa, Managing Director of ABC Transport Company, Mr. Frank Nneji, President of South East South South Professionals, Emeka Ugwu-Oju, President of the Aba Chamber of Commerce, Sir Emma Nwakpadolu, Abia State National Association in North America and Gbenga Sesan of Paradigm Initiative in Nigeria among others. The Summit, which was co-funded by Ford Foundation, had in attendance the Speaker and Members of the Abia State House of Assembly, Members of the Abia State Executive Council, Heads of International Development Partner Organisations, Industrialists the Vice Chancellor, Abia State University, Prof. Uche Ikonne and other academics and over 500 Delegates from far and near.